It won’t be long now! 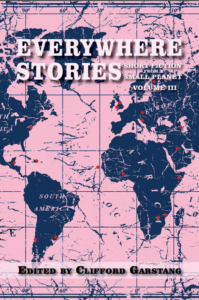 Here is the cover for Volume III of Everywhere Stories: Short Fiction from a Small Planet. This is the series I edit for Press 53, the first two volumes of which came out in 2014 and 2016. In this volume, we again have stories set all over the world. This time, readers will visit Saudi Arabia, Wales, Mongolia, Finland, Australia, Somalia, Zimbabwe, Myanmar, Azerbaijan, Croatia, and more! While publication is still a few months off, in the coming weeks I’ll be posting here more information about the contributors to the anthology and their stories. It’s a great book (as are the first two volumes), so stay tuned!